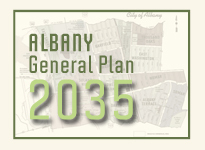 The Albany City Council will hold a public hearing on the new Albany 2035 General Plan on Monday April 18 at 7:30 PM. The Council also will consider the Final Environmental Impact Report, which includes Responses to Comments on the Draft Environmental Impact Report published in November 2015. The Planning and Zoning Commission recommended Council approval of the General Plan at its March 9, 2016 meeting. The recommendation included an “Addendum” to the Plan which identifies specific text changes to be adopted by reference. The hearing will be held in the Council Chambers at Albany City Hall at 1000 San Pablo Avenue. The public is encouraged to speak on the item. More information, including the staff report, may be found on the “Document” tab of this website.